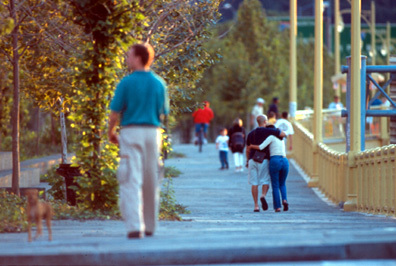 Two active park promenades running alongside the Allegheny River, one upland, the other at river level. 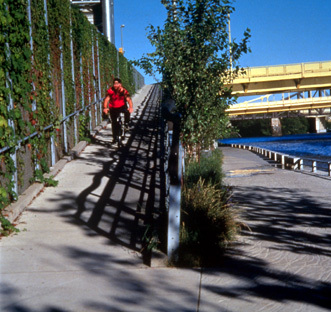 Allegheny Riverfront Park has invigorated two long, narrow spaces pinched between the Allegheny River and major expressways, reviving relationships among the city, its inhabitants, and its river. The lower level brings you to the riverÍs edge and is planted with native floodplain species that can regenerate themselves after flooding. 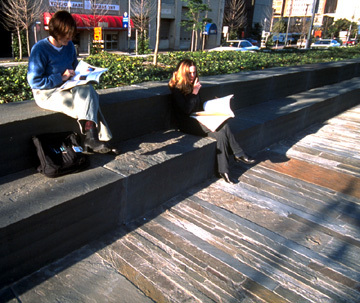 The upper level promenade is more urbane with spectacular views and with plantings and materials traditionally found in PittsburghÍs public spaces. The two levels are linked by long ramps that use vines to screen park users from the highway. Pittsburgh has long used its rivers for utilitarian purposes, but not until recently has the city fully recognized their recreational possibilities and their importance as natural resources. Before the park was built, the lower level was an inaccessible parking lot and the upper level was a fairly narrow sidewalk next to a major roadway. The most remarkable thing about this park is the way it has completely transformed these two hostile spaces into a welcoming and well-loved public place. Allegheny Riverfront Park is all about circulation and forming strong ties between downtown and the riverÍs edge. The park is extremely accessible and accommodates people arriving on foot, on bikes, in wheelchairs, and in boats. Special attention has been paid to making the paved spaces feel special - the upper level is comprised of irregular bluestone paving, the lower level is concrete imprinted with plants. Funding is now being sought to link the park to Point State Park to the west, and the new convention center to the east, thus forming a continuous recreational space along the river. There is abundant seating, positioned to take advantage of the spectacular river views. The trees on the upper level provide shaded spaces to relax in the summer, and the lower level brings you close enough to the river that you can reach down and touch the water. Both levels are great places to bring your lunch. 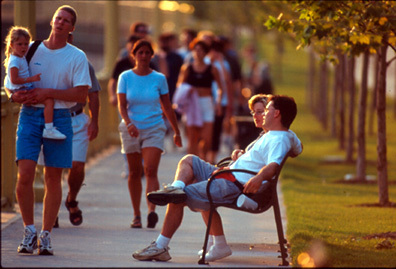 Because Allegheny Riverfront Park is so well-suited to routine uses such as jogging, in-line skating, and dog-walking, the park is very active and there is a constant stream of visitors, making the park feel very safe. Although the park is too narrow for much programmed recreation other than boating, even a quick visit will offer a little respite from the city. Long-term uses strengthens park usersÍ awareness of the river in all of its stages. The esplanades are wide enough to accommodate the heavy usership comfortably, but they are also narrow enough to encourage face to face contact and greetings among fellow park users. 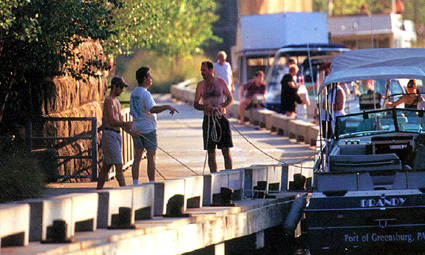 The marina fosters camaraderie both among boaters and among those who merely like to look at boats. 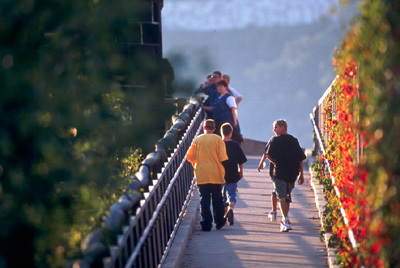 Excerpt from the Pittsburgh Cultural Trust website: The concept of a riverfront park has existed since 1911 when the Olmsted Brothers, son and nephew of Frederick Law Olmsted, creator (with Calvert Vaux) of New York's Central Park, proposed the creation of two narrow strips of public land - one following the south bank of the Allegheny River and the other running along the north bank of the Monongahela River. 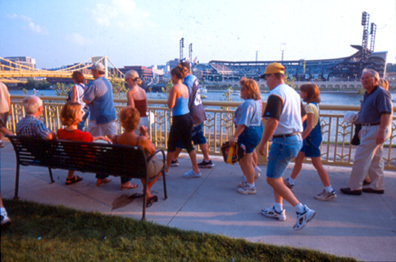 The proposal lay dormant until the early 1990s when The Pittsburgh Cultural Trust's District Plan called for the creation of a riverfront park to border the northern boundary of the Cultural District. 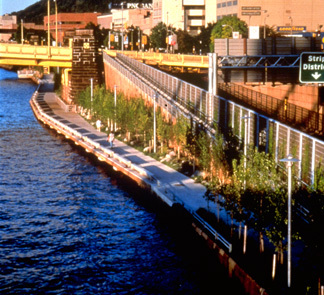 At that time, the Trust's Public Arts Advisory Committee commissioned a first-time collaboration between artist Ann Hamilton and landscape architect Michael Van Valkenburgh to create the Allegheny Riverfront Park. 13 steps to great destinations. Corpus Christi is currently undertaking a unique, creative, and bold effort to build a world class waterfront in its downtown. From Sydney Harbor to Coney Island, these special places get us to the water.